Szentendre is very close to our capital and cruising on the Danube is even brings it closer. With us You can arrange a perfect one-day long leisure program or You can choose DunaTaxi’s guaranteed transfers. The city’s history is very diverse and colorful. We believe everybody can find their interest in Szentendre, but even just to grab an ice-cream or “lángos” (deep fried flatbread). Below You can read all the past which created the present atmosphere. In the 1st century, it was enclosed to the Roman Empire as the part of the Pannonia province, because the river was used as the eastern frontier of the Empire. Szentendre was called that time Ulcisia Castra (Wolf Fortress) it came from the previous name of the city, which was given by the inhabitants. A military post was built in the first years of the 2nd century, near to the stream Bükkös where nowadays the Roman lapidary exhibits the remains. The camp was suitable to garrison 1000 troops, which mean it had a quite important role, so several emperors visited the town. The nomadic attacks from the other bank of the Danube made the Romans to leave the city around the 5th century. Based on the archaeological findings the city was occupied in the 6-7thCentury by some avar tribes. The century of the migration of nations was interrupted by the Hungarian conquerors, so the territory was possessed by Kurszán then Árpád during the 9-10. century. During the reign of István I., Szentendre belonged to Visegrád County, under the episcopate of Veszprém. Most likely the name of the city was originated from the parish church’s patron saint, Saint Andreas but there is also an idea that the name may come from king Andreas I., who established an orthodox cloister to the memory of the apostle Andreas, who, according to the legends, was the founder of the Russian- Orthodox Church. As the Turks advanced forward on the Balkans, more and more Balkanian noblemen and priests began to withdraw with their people northwards. They hoped that Hungary would not be conquered by the Turks so they settled down in the 16-17th Centuries, but unfortunately, in 1541 when Buda was conquered by the Turks, Szentendre became the Pasha of Buda’s territory for almost 150 years. Eventually, as Buda was recaptured in 1686 the Turks left the city completely ruined. 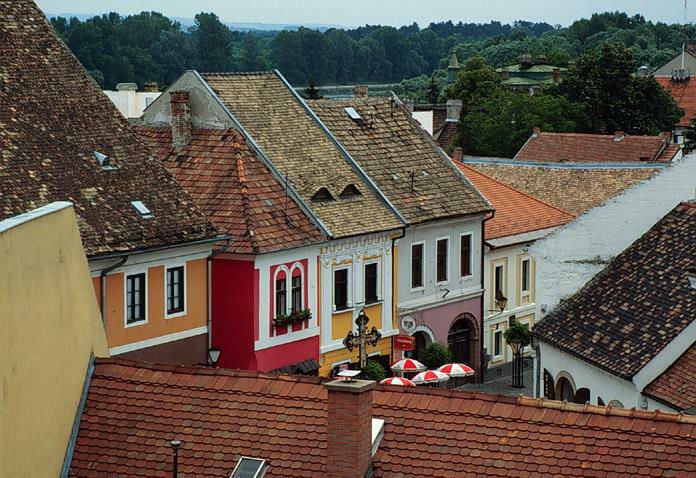 According to some sources, Bulgarians and Dalmatians appeared in Szentendre already in the 15th century. After the liberation from the Turks, Szentendre enjoyed a rebirth with Mediterranean leanings, as Croatian, German, Slovak, Greek and Serbian people moved in and lived together with the Hungarian inhabitants. (Szentendre is still the center of the Serbian settlement in Hungary.) When these people arrived, the town was ruined, almost deserted. They all preserved their unity and with the leadership of their priests they built their wooden churches separately and settled around them. The favourable soil and advantageous location of the Danube valley slopes brought excellent grapes and fruits. Serbians introduced a special red wine culture here. Each of the Serbian temples was built in the 18th century and they are important works of the Hungarian Baroque architecture. The interiors of the churches are the masterpieces of the Eastern Church craft. The significance of the town was further increased by the fact that it was the church and cultural centre of the Serbs living in Hungary. It became an Orthodox Episcopal seat. The leaders of the Orthodox Church always played an active role in preserving and increasing the political and economic privileges of the Serbs several church leaders were members of rich families of Szentendre. The houses of Serbian tradesmen were located mainly around the Main Square and its surroundings along the bank of the Danube. They stored their wine in huge cellars, they had a little shop on the ground floor open to the streets, the flat was above, and storage took place in the attic. This layout is still noticeable on the houses around those main streets (Bogdányi, Dumtsa Jenő, Görög street). For the construction, they used the material from the Roman and medieval ruins. So then Szentendre had to resuscitate from its remains, and turned into lively, multi-racial, polyglot hometown of numerous religions and customs. This colourful settlement was developing during the 18th century, the known townscape of the inner city is still untouched and preserved the beauty of the old town and it is characterised by a south European atmosphere with much baroque architecture, churches of various religions, narrow side streets, and cobblestone roads. The rich merchants who once ruled the city erected Baroque and Rococo buildings, worthy of their social status, in the 18th century. In the first half of the 19th century great floods and conflagrations damaged the town, destroying all the properties of many citizens. In 1838 the most serious flood over flew the lower parts of the town. 172 houses were ruined by the water. The highest water level is marked even today by two contemporary plaques on the walls of the houses in Péter Pál and Kör Street. After the floods another misfortune reached Szentendre. In 1882 the destruction of phylloxera, setting out from Tótfalu and spreading lightning-fast, destroyed the vineyards of the region and put an end to the history of its viticulture famous all over Europe. The effect of the disease ruined the whole society of the town as well. The extermination of the flourishing grapevine caused a disaster because in the previous decades many people had invested into this profitable sector. By the end of the century the decline of the town had stopped. Jenő Dumtsa the judge and later the mayor of the town had the moor land of the borders drained. Due to this order extensive plough-lands were gained. They started to replace the destroyed vineyards with fruit trees. There was a boom in animal husbandry. The structure of the town’s society had changed because the homeland of the immigrants got independent attracted the people to move back. So, they returned home in large groups. Around the end of the 19th century, the region was enriched with a new feature: holiday homes and resorts were built. Leányfalu, which was an uninhabited wasteland before was discovered by capital city artists. During the Kádár-period many countryside towns gave a home to new exhibition places with the pieces of modern and contemporary art collections. These collections were created by locals’ initiatives. At the beginnings, the governance just tolerated their existence but later on started to support them. As the artist wanted to emphasize the actual life situation, show the real circumstances the support disappeared immediately. From that time the non- describing, non-figurative pieces of art became the most important for the governance since those had the least connection, the least association with the society it came from. Béla Veszelszky, Dezső Korniss, Pál Deim, Erzsébet Schaár and Tibor Csernus are just some of the artist who was satisfied with this point of view of the governance, so they could settle in the organization of the museums, exhibitions, until they were avoiding to create something recognizable, something similar to the world they were living. Szentendre small museums and galleries born under these circumstances and the “city of the painters” tourism slogan spread through the country.